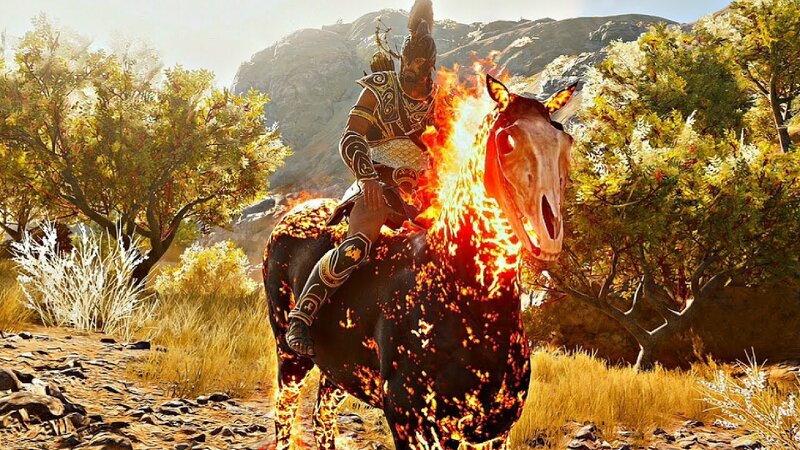 A look at how to get the coveted fire horse skin in Assassin's Creed: Odyssey. In Assassin’s Creed: Odyssey, one cosmetic item players have been wanting to know how to get is the Abraxas Legendary Mount Skin. There are a variety of customization options in Assassin’s Creed: Odyssey not only for yourself but also for your horse, Phobos. By unlocking new skins, you’ll be able to change how Phobos looks in Assassin’s Creed: Odyssey. Having a hard time unlocking the Abraxas Legendary Mount Skin in Assassin’s Creed: Odyssey? We’ve got you covered! Below, we’ve put together a quick guide on how to get the Abraxas Legendary Mount Skin in Assassin’s Creed: Odyssey. To get the Abraxas Legendary Mount Skin in Assassin's Creed: Odyssey, you'll need to find and defeat Exekias the Legend. It can be quite a challenge to get the Abraxas Legendary Mount Skin in Assassin’s Creed: Odyssey. To unlock this skin, players will need to find and defeat Exekias the Legend. As the leader of the Heroes of the Cult, Exekias is a powerful Level 50 mercenary that can be quite troublesome to kill. Additionally, “Heroes of the Cult” is a side quest in Assassin’s Creed: Odyssey that’s similar to hunting down members of the Eyes of Kosmos. By hunting these cultists, you can unlock special weapons, gear, and armor. To find Exekias, you’ll need to track his location by opening up your menu and clicking the Mercenary tab. There, you’ll be able to view different cultists, their levels, and their locations. In this tab, you can also hunt other Mercenaries to raise your Mercenary level, which is required when hunting down Exekias. Because Exekias is the leader of the Heroes of the Cult and a Level 50 enemy, we recommend reaching at least Level 46 before going out and hunting him down. This can be done by hunting other members of the Heroes of the Cult using the Mercenary tab. Once you’re ready, Exekias the Legend can be found in the “Olouros Fortress” within the Achaia Region. He’s located right in the middle of the Fort, though you’ll need to take out other cultists in his branch in order to confirm the kill of Exekias and collect your Abraxas Legendary Mount Skin for Phobos. For more information on how to get the Abraxas Legendary Mount Skin, be sure to check out the helpful video below courtesy of YouTuber Shirrako! For more on Assassin’s Creed: Odyssey, be sure to check out some of our previous guides including where to find all Silver Vein cult members in Assassin’s Creed: Odyssey, where to find all Gods of the Aegean Sea in Assassin’s Creed: Odyssey, and all Eyes of Kosmos member locations in Assassin’s Creed: Odyssey. By reading through this guide, you should now know how to get the Abraxas Legendary Mount Skin in Assassin’s Creed: Odyssey.